Lamoral Egmont (1522-1568) was a Flemish general and statesman whose execution by the Blood Council inspired works by Goethe and Ludwig van Beethoven. Egmont was born in Hainaut, Belgium. As a general of the Habsburg emperor Charles V, he won victories over the French at Saint Quentin (1557) and Gravelines (1558) that made him a popular hero. 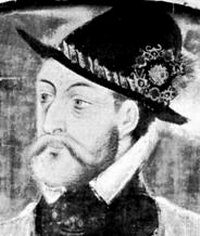 He was appointed governor of Flanders and Artois by Charles's son, Philip II, King of Spain. Egmont joined William I, Prince of Orange, in protesting to Philip against the infringement of Flemish liberties and the introduction of the Inquisition into the Netherlands. In 1565 he made a trip to Spain to inform Philip of the great resentment felt toward his policies. After his return, when insurrections arose, Egmont took action against heretics in Flanders, indicating his submission to Philip's policies. When Fernando Alvarez de Toledo, duke of Alva, was sent in 1567 to restore order in the country, Egmont and another Flemish nobleman, Philip de Montmorency, count of Hoorn (1518-1568), remained there in spite of warnings from Prince William to leave the country, and Alva had them imprisoned. They were condemned to death by the Blood Council and beheaded in Brussels; this event was used to date the beginning of the revolt of the Netherlands against Spanish rule. Goethe used incidents in Egmont's life as the basis for his tragedy “Egmont” in 1788, for which Ludwig van Beethoven wrote incidental music and “The Egmont Overture” in 1810.